This photo was taken in the first week in March 2012. The "Take It!" came from my surprise in walking up a hill to take a photo of something else that just did not want to take on what I had envisioned for it. I turned to leave and there was this shadow of branches from a tree that were behind me all the while. I had walked over them on my way toward the other object and had not paid any attention to them as I was so focused on the initial subject. 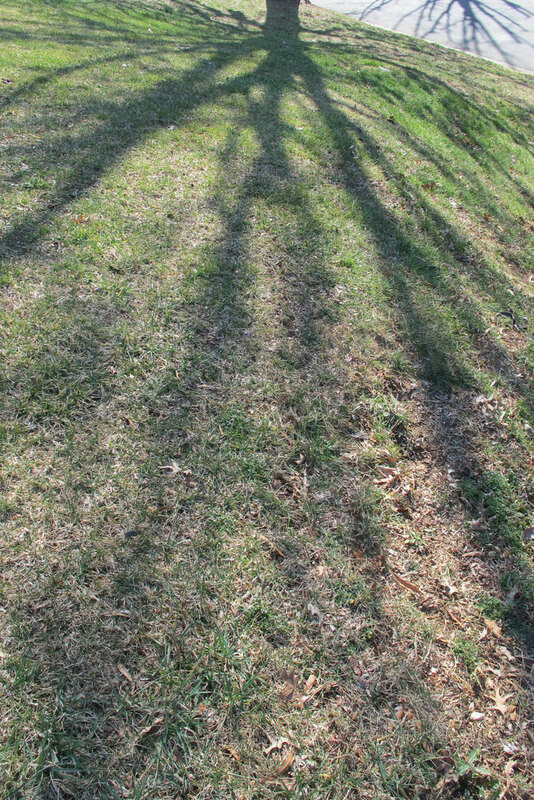 In this photo I was able to catch how the shadows seemed to go on forever and seemingly take me up in them. The After Take: I enjoy this photo for its top to bottom image involvement. It is rare when I have any subject be intentionally looked at in this way. I am usually looking for an interesting mix that breaks up long lines. With the base of the trunk being at the top of the picture one could have an idle thought in wondering if the roots of the tree just might follow the same pattern as the shadows, thus giving us a sort of erie cosmic xray? In some earlier photo notes I have made mention of taking guilty pleasure in not having much snow. Well it looks like we are in for a bad fire season as a result. My condolences go out to those who have to be involved with the results of this fire season madness. Thanks for joining us for the current photo presentation. You are cordially invited to return Tuesday April 24 for a new picture that we hope you will enjoy. Those would be some HUGE roots lol.